All calves should have access to cow’s colostrum within 12 hours of birth. Colostrum aids with the development of calf immunity, passing the first faeces (meconium), reduces diarrhoea and is a superior source of nutrients. After 12 hours antibody absorption in the calf markedly deteriorates, reducing the benefit of colostrum intake. Once colostrum has been given the calf can then be reared on a commercial milk replacement (readily available from most stock feed agencies). Milk should be fed warmed at 39-40 degrees celsius for the first 3 weeks of life. Water should also be made readily available at all times. Growth rates in calves should be balanced. 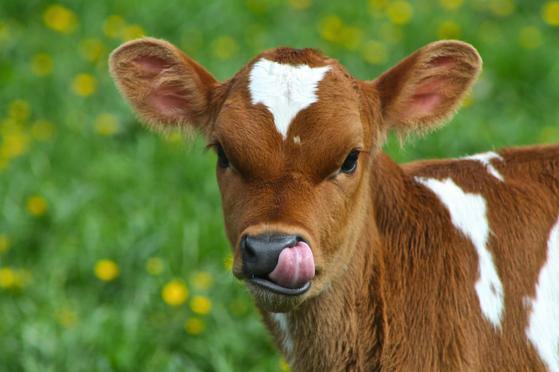 Calves should be encouraged to eat dry food as soon as possible. Calf starter pellets can be introduced from 3 days of age. Always provide ad lib access to good quality hay and fresh water. Weaning can be as early as 8 weeks of age, but the calf needs to be weaned on to a supplement of grain unless it has access to very good spring grass / clover pasture.